Advanced predictive technology took center stage last week at the third International Conference on Innovation in Artificial Intelligence (ICIAI-2019) and the fourth IEEE International Conference on Big Data Analytics (ICBDA-2019) joint event in Suzhou, China. Highlights included promising R&D work on recommendation systems, Big Data analytics, and AI algorithms. Several of the presentations focused on predictive technology. Dr. Zhipeng Zhang of Liaoning Normal University, China, presented an interesting idea related to recommendation systems that seek to predict what items would be interesting to an individual user. His idea reorganizes the information of users’ ratings on items/products, then the diffusion process is applied to the reorganized information to generate better recommendations than that of the conventional collaborative filtering algorithms. Given my own research on the diffusion process, I immediately realized the usefulness of this model. This work has very interesting implications for providing better predictions of what products would be interesting to a user, along with other applications in different business scenarios. Professor Jiannong Cao of Hong Kong Polytechnic University gave the keynote presentation, “When IOT Meets Big Data.” The Internet is evolving into a medium that connects objects in the physical world. Called the Internet of Things or IOT, it has many applications such as smart cities, logistics, industrial control, and healthcare. While current IOT technologies focus on connecting, monitoring and controlling things remotely, as IOT continues to develop, further potential could be realized by combining IOT with related technologies such as Cloud Computing, Big data, and AI. Termed SMART IOT, Dr. Cao shared his ideas of how SMART IOT can help solve challenges such as asynchronized data generation, privacy concerns, and data sparsity. 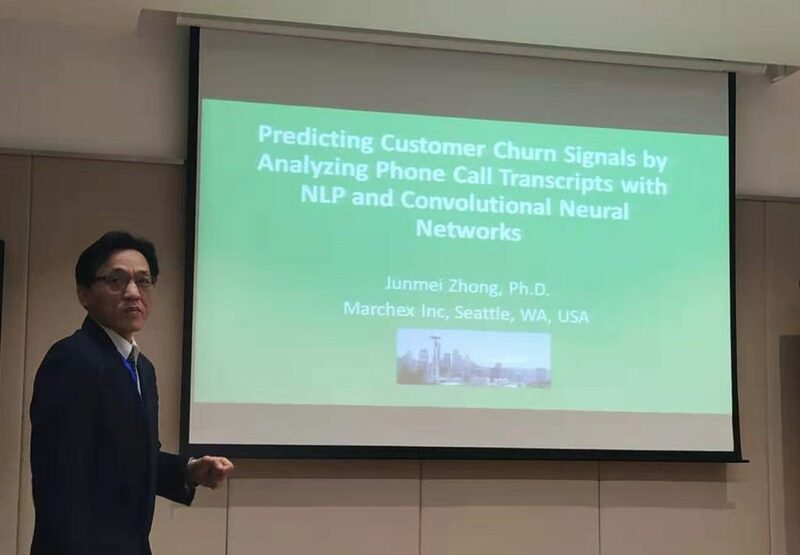 I had the honor of presenting our AI and Natural Language Processing (NLP) work on churn prediction. Our team created an AI/NLP model that predicts when customers are planning to switch to other service providers based on churn patterns that surface in caller transcripts. With sufficient training data from phone call transcripts annotated by our innovative data labeling technology, our proposed convolutional neural network model has the potential to be very powerful. With the knowledge that a customer is predicted to churn, businesses can take effective steps in their interactions with the customer to prevent churn before it happens. To learn more about Marchex AI technology, check out this article on Marchex speech recognition functionality or visit our Conversation Edition product page.